Easy enough for weekdays, these delicious eggs are also great for brunch get-togethers. The best part? Most of the prep work can be done in advance! I visited my sister, Annie recently and she served some delicious baked eggs for breakfast one morning. It wasn’t a complicated recipe, simply eggs baked in muffin tins. But they were perfect, with firm whites and runny yolks. Coarse black pepper, flaky sea salt and a sprinkle of finely chopped fresh herbs finished them off. It was a wonderful, healthy way to start the day with whole grain toast and fresh fruit. I loved the baked eggs so much I requested them the following morning (You can do that with sisters!). Guess what Scott had for his morning meal the first day I was back home? Even though my plane arrived close to midnight, I was up the next morning, trying out the baked eggs on him. The following day, I had some fun trying a little different approach. I picked up a large bag of whole grain rolls and began experimenting with scooping out the centers and baking the eggs right in the rolls. It took a few tries to get the technique down pat, but we love the results. I call them Bread Basket Baked Eggs. 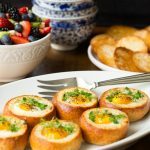 They’re perfect for an easy, everyday breakfast, but they would also be great for a spring brunch, as most of the prep work can be done ahead of time. Preheat oven to 350˚F. Line a sheet pan with foil or parchment paper for easy cleanup. Slice the top off of each roll (about a quarter of the roll) and set the tops aside. Here’s a little trick I learned. If you’re like me, you might get a little overzealous when cutting out the centers. Check each roll when you finish by holding it up to the light. (See that little hole in the first image above?) If you notice a small hole, take a small piece of bread (from one of the leftover cutout centers), place it over the hole and push it down with your finger to form a little “plug” for the hole. Brush the rims and outsides of each roll with melted butter (about 1 teaspoon per roll) and place on prepared pan. The butter will make the rolls super crisp and delicious after baking. (If you’re watching your calories, this only adds 34 calories per serving, but adds tons of flavor). If prepping ahead, place all rolls on a baking sheet at this point and cover with plastic wrap or foil till just before baking time. 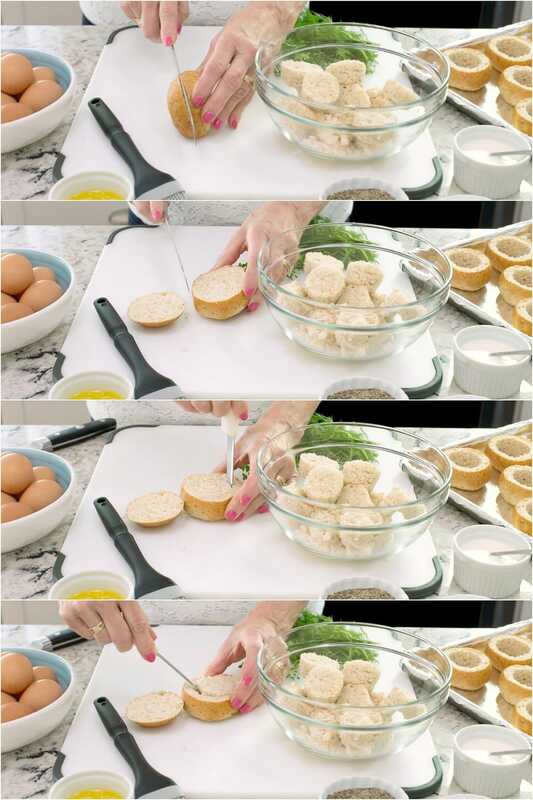 Break an egg into a small bowl (check for any tiny bits of shell) and pour it into the “bread basket”. Repeat for all the rolls and eggs. Add 1/2-1 teaspoon of cream to each egg and a sprinkle of kosher salt and black pepper. Ready to bake! Bake for 18-22 minutes or until egg is set. Remove from oven and sprinkle with your choice of fresh herbs. Serve and enjoy! Add a pretty dish of fresh fruit, some creamy yogurt and a bowl of crunchy Double Almond Granola for a fabulous and healthy breakfast or brunch! Thanks for the inspiration for these delicious baked eggs, Annie! 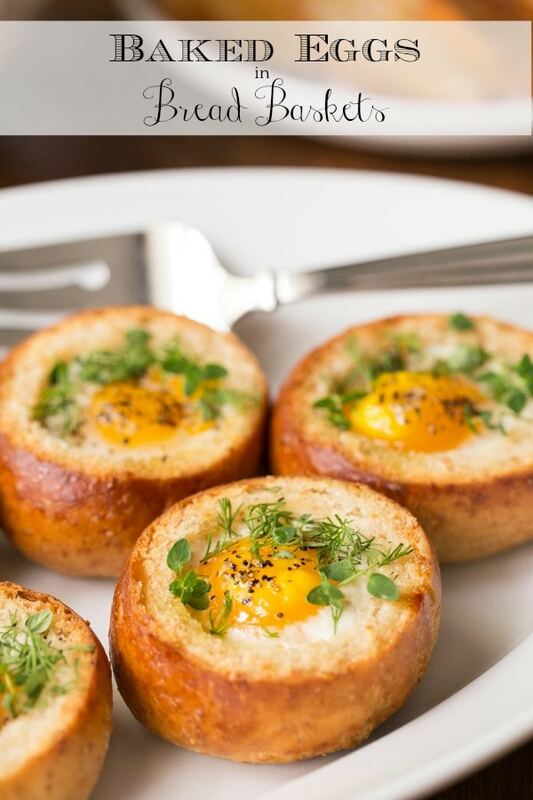 The size of your rolls will determine what size eggs you should use. If your rolls are fairly large, medium or large eggs will work well. 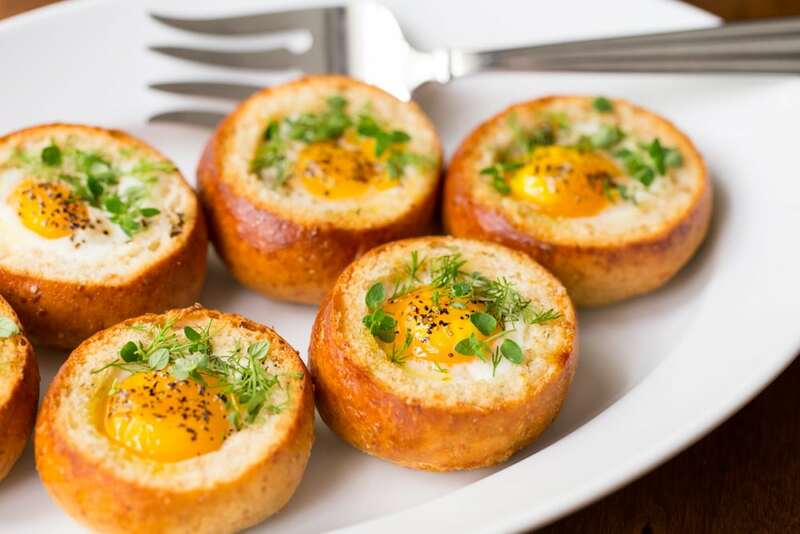 If the rolls are small dinner size rolls, you may need to use small eggs. I recommend trying one roll out with an egg before finishing prep. 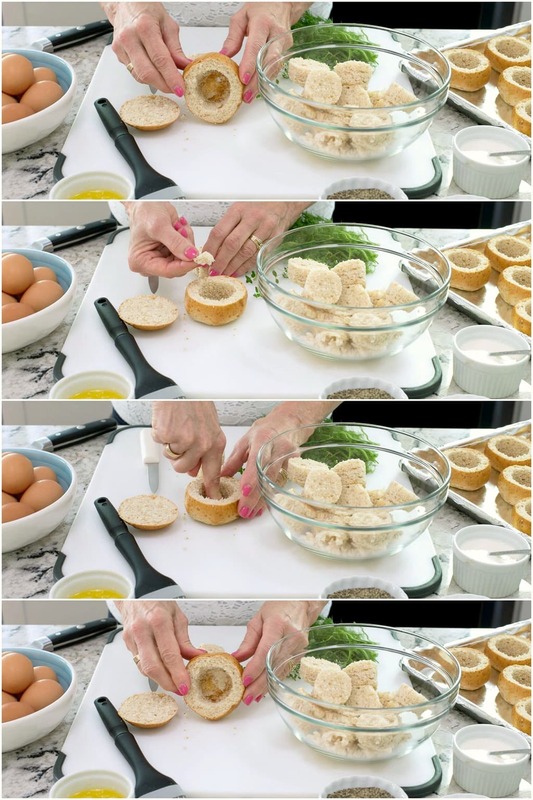 If you find your eggs are too large for your “baskets” and you don’t have the option of smaller eggs, you can pour off a little of the white before adding it to the bread basket. I found the best way to do this, is to break the egg into a measuring cup with a spout. If the white is very thick and you can’t pour off just a little, begin to pour, then cut a bit of the white off with a kitchen shears. Save the centers to make bread crumbs for future use. Just allow them to dry out, then whirl them around in a blender. Baking time will depend on the size of eggs as well as the size of the rolls. Larger eggs will take a few minutes longer to bake. 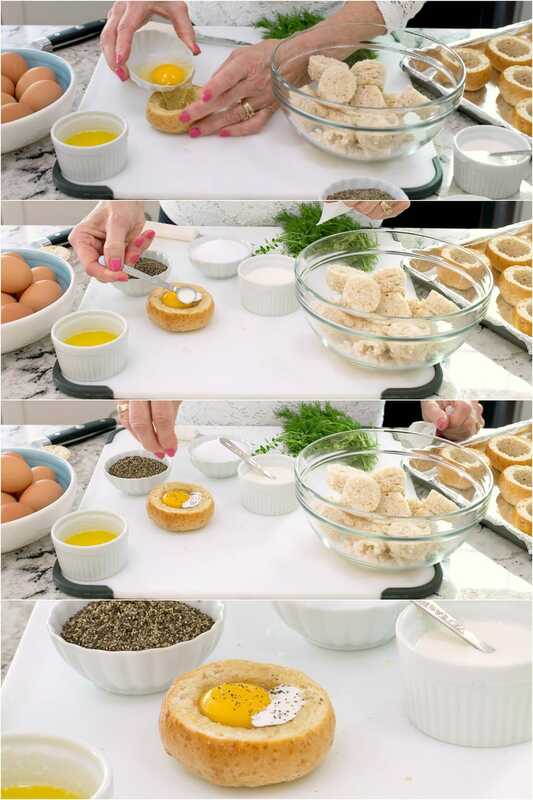 Use this recipe as a template. In other words, feel free to change up the size of the rolls and the eggs. Use large rolls and eggs. Make as few or as many as you want. Use your favorite fresh herbs or dried herbs. Italian seasoning is great. 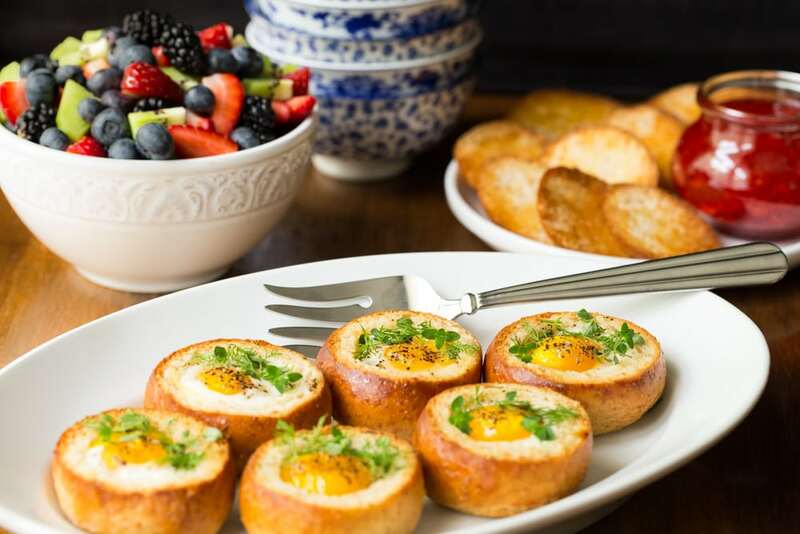 Perfect for an easy, everyday breakfast these eggs are also wonderful for breakfast and brunch get-togethers, as most of the prep work can be done ahead of time! Brush the rims and outsides of each roll with melted butter (about 1 teaspoon per roll) and place on prepared pan. The butter will make the rolls super crisp and delicious after baking. (If you're watching your calories, this only adds 34 calories per serving, but adds tons of flavor). If prepping ahead, place all rolls on a baking sheet at this point and cover with plastic wrap or foil till just before baking time. 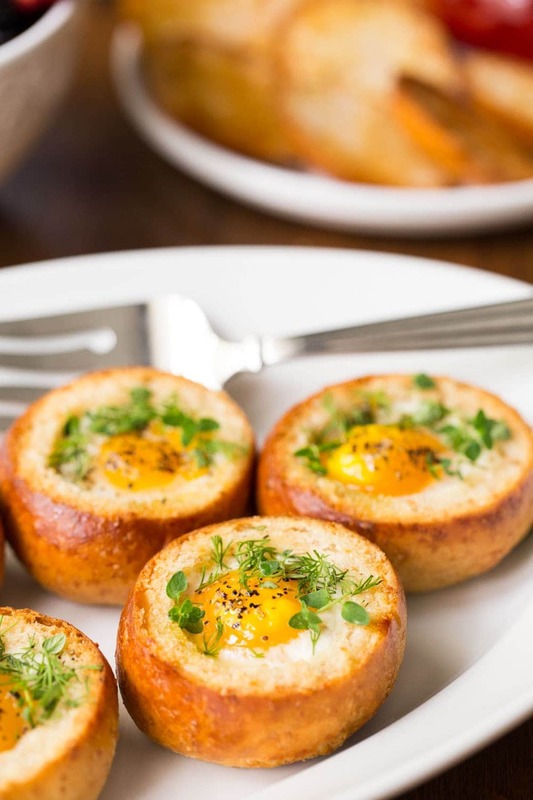 Eggs in bread baskets are so simple to make. I’ll try it next week. Was there ever an answer to cooking the eggs longer so that the yolk isn’t runny? I was wondering how long they had to cook them. These sound delicious and can’t wait to make them. Hi Marjie, my husband doesn’t like his yolks runny so I just leave his in a few minutes longer. DC is a great place! The last few times I’ve been there have been for business, and I really didn’t have time to see/do anything. I need to make a road trip! But first, I need to make these to fuel up. Wow, what a fun recipe! Very creative — thanks. Love these! I’ve made something very similar but with croissants. Takes ‘Toad in the Hole’ to a whole new level 🙂 Sounds like you had a wonderful time with your sister. So nice you stay in touch! 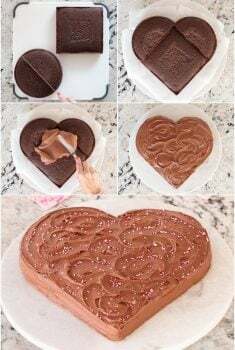 Your step by step photos are so helpful and though simple to put together this would be a very special treat. I love these, Chris! 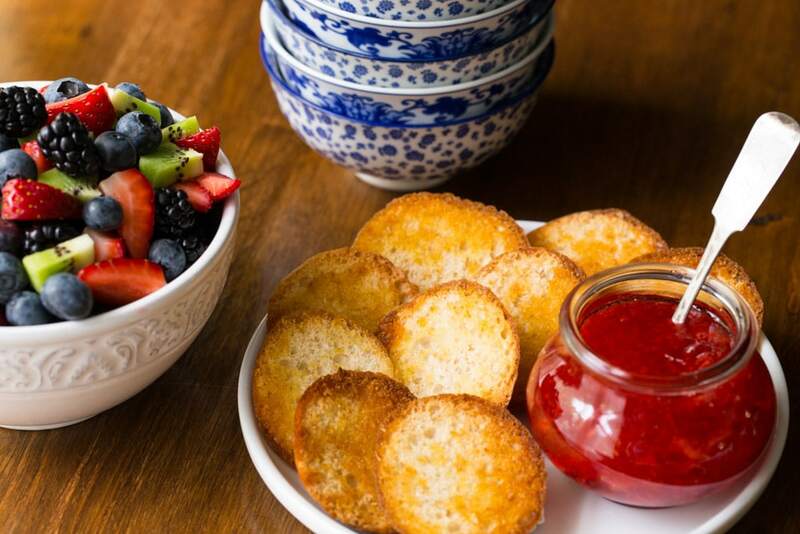 The presentation is too cute (perfect for Mother’s Day brunch!) and I love the herb garnish! Beautiful way to prepare eggs Chris, great tips and technique. Sounds like you had a wonderful time visiting your sister, DC is a pretty fun place whether you see much of it or not. I went a few years ago when my daughter lived there and we only visited a few monuments, we spent our time shopping, lol. Thanks Cheri, yes there are lots of good places to shop too! Hard to fit it all in 🙂 We’ll just have to go back! I love DC but haven’t been there for years. The last time I went to the National Cathedral I was with my mother and she’s been gone for many years. We loved the cathedral with all its nooks and crannies. Your eggs in bread baskets and the resultant little toasts would be a wonderful breakfast. What a fun memory Maureen and a great place to have made it, I know you hold that dear in your heart. Love love LOVE this idea Chris ~ I’m an eggs for dinner type, so I know I’ll be making these soon. I bet that crispy bread and the runny yolks are heaven together!! And I love those eggs that you posted recently Sue. Who knew there were so many wonderful ways to make eggs! Bill would love these!! Especially with a side of bacon or sausage. 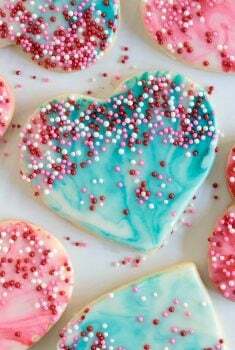 And these would be fabulous for a brunch! It looks fabulous, but I have one question….what is the cream for? Seems like it would just make the bread soggy? bit longer and not brushing the top to soon as you suggested to another reader. It’s funny Cindy, I wondered the same thing. I decided to use a little cream because that’s how the French make their baked eggs. But then I decided to try it without the cream and see how they were.The eggs were a little tough. I think the little bit of cream helps keep things moist. And it doesn’t make the crust soggy at all. I don’t think it’s enough to do that. I have to give these a try. You make it all look so beautiful. Glad you could spend time with your sister. Aww… thanks Madonna. Hope you’re doing well! I’ve missed you! 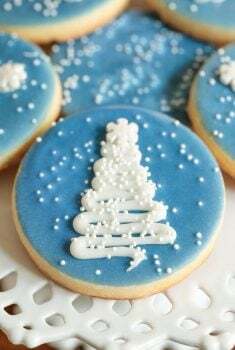 How cute would these be for Christmas brunch also!? Have to find buns just like yours..I have had the eggs in muffin tins..and even in the muffin cups draped in plain white bread or prosciutto..nothing this cute.Thank you! Thanks Monique! 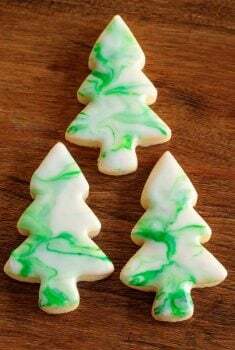 They’d be perfect for a Christmas brunch. I think it would also be nice to serve them on a little pool of marinara for an Italian version! Oh, and I got the rolls, a huge bag, at Sam’s Club – not sure if you have them in Canada. I have made something very similar many times, but the problem is, how do you keep the bread edges from burning? They always get very dark and almost burned. Hi Barbara, I haven’t had a problem with the edges getting burned but I don’t bake them past the whites getting firm. You could try not brushing them with butter till near the end. this sounds like heaven for supper to me, I am always looking for non meat options, and this is so simple and so easy…I would have never thought to add cream, heaven! Thanks Chris! Absolutely gorgeous! Can hardly wait for the perfect opportunity to impress with theses beauties. Would you mind sharing the herbs you used? I have a small herb garden but I’m having a little trouble identifying those in the pictures, maybe baby oregano? snippets of dill? I think the choice of herbs with eggs would have to be carefully selected since all varieties may not go well. Thank you for another “keeper” I made your Honey-Bourbon glazed salmon just this week, it was simply delicious! I must tell you, I find your recipes to be extremely well thought out, easy to follow and my oh my, such beautiful pictures! Hi Patricia, thanks so much for your very kind words. I appreciate you taking the time to leave a comment. For the eggs in the picture, you guessed well, I used snippets of dill and a little lemon thyme. Rosemary is also delicious with thyme or basil and a little fresh oregano and Italian parsley are wonderful. You could also add a little lemon zest chopped with the herbs. They look awesome and perfect for the weekend brunch table! i make this!! Sometimes I put baby spinach and/or ham in the bottom, then sprinkle the egg with some cheese. It is so good! Yum, your version sounds wonderful Ginny! These are just plain adorable! Who wouldn’t love to have these for breakfast?! They would be great for Mother’s day, or any day for that matter. Nice how-to shots Chris. Have a happy weekend! Pinning and sharing.